Objective To investigate whether characteristics of schoolbag use are risk factors for back pain in children and adolescents. Data sources Electronic searches of MEDLINE, EMBASE and CINAHL databases up to April 2016. Eligibility criteria for selecting studies Prospective cohort studies, cross-sectional and randomised controlled trials conducted with children or adolescents. The primary outcome was an episode of back pain and the secondary outcomes were an episode of care seeking and school absence due to back pain. We weighted evidence from longitudinal studies above that from cross-sectional. The risk of bias of the longitudinal studies was assessed by a modified version of the Quality in Prognosis Studies tool. Results We included 69 studies (n=72 627), of which five were prospective longitudinal and 64 cross-sectional or retrospective. We found evidence from five prospective studies that schoolbag characteristics such as weight, design and carriage method do not increase the risk of developing back pain in children and adolescents. The included studies were at moderate to high risk of bias. Evidence from cross-sectional studies aligned with that from longitudinal studies (ie, there was no consistent pattern of association between schoolbag use or type and back pain). We were unable to pool results due to different variables and inconsistent results. Summary/conclusion There is no convincing evidence that aspects of schoolbag use increase the risk of back pain in children and adolescents. Schoolbag characteristics are one biomechanical factor often implicated as a cause of back pain in children and adolescents. Despite the lack of convincing evidence, schoolbags have been traditionally linked to back pain in children and adolescents.11 Heightened awareness of this issue by the general public means that clinicians are frequently asked for advice on a preferred style of schoolbag and/or how to carry the schoolbag to reduce risk of back pain.12 More specifically, the attention on the magnitude of load carried by children and adolescents to and from school has been increasing. The aim of this study is to investigate whether characteristics of schoolbag use (eg, weight, duration of use, bag design, method of carrying bag, perceived weight) are risk factors for back pain in children and adolescents. Systematic searches were conducted in MEDLINE, EMBASE and CINAHL from their inception until November 2017. The search strategy included spinal pain terms, terms related to children and adolescents and terms related to schoolbags; the search strategy was based on previous Cochrane reviews in relevant areas (online supplementary appendix 2). Additional strategies (eg, examination of reference lists and citation tracking of included studies) were used to identify further eligible studies. Searches were not limited by language; collaborators with the relevant language skills assessed studies published in languages other than English, Portuguese and Spanish. We included prospective longitudinal cohort studies, cross-sectional studies and randomised controlled trials (RCT) that studied back pain as the main outcome. Eligible studies needed to include children or adolescents of school age as participants and report information about ‘carrying a backpack’. Two reviewers independently screened titles and abstracts and excluded irrelevant records. Full-text articles were assessed by two reviewers independently to identify studies that met the inclusion criteria. Any disagreement was resolved by consensus. statistical measure to quantify association (eg, relative risk, OR, HR) and 95% CI. The risk of bias assessment of the longitudinal studies was assessed by a modified version of the Quality in Prognosis Studies (QUIPS) tool, which has been recommended by the Cochrane Prognosis Methods Group. The QUIPS was modified to judge bias in relation to risk factors, instead of the original tool’s focus on prognostic factors. The following six domains were considered: (1) study participation, (2) study attrition, (3) measurement of risk factor, (4) measurement of, and controlling for confounding variables, (5) measurement of outcomes and (6) analysis and reporting. Each domain was assessed as having high, moderate or low risk of bias. The overall risk of bias was also assessed. We considered a study to be of high quality when the risk of bias was rated low on at least four of the six domains and was rated low for both study attrition and study confounding. Two reviewers assessed the risk of bias of the studies independently and discrepancies were resolved by consensus, if necessary, a third author helped to reach the consensus. We planned to incorporate risk of bias ratings into interpretation of findings by comparing results from studies at low risk of bias to those from the total pool of included studies. Longitudinal and cross-sectional designs were assessed separately. To analyse whether characteristics of schoolbag use are risk factors for back pain, the relationship between schoolbag characteristics and back pain was explored and pooled if adequate numbers of longitudinal studies examining similar risk factors were identified. For the cross-sectional studies, we performed a descriptive analysis to report the factors associated with back pain. We made the decision a priori to primarily base conclusions on findings from longitudinal studies because they offer a more robust design for making causal inferences. The decision as to whether to pool studies was made on the basis of clinical and methodological homogeneity; this involved subjective decision based on consensus among the authors. Key factors in this decision included measures of exposure and outcome, timing of data collection and reporting of analyses. The searches retrieved 6597 studies. After removing duplicates and screening titles and abstracts, we included 160 studies for full-text assessments; we could not access the full-text for six of these studies and attempts to contact the authors were not successful. A total of 69 studies met our inclusion criteria and were included in this review (total n=72 627 participants). We included four longitudinal cohort studies (n=1743), one RCT (n=108), 63 cross-sectional studies (n=70 720) and one case–control with retrospective data (n=56) (figure 1). The characteristics of the prospective studies (longitudinal cohort and RCT) are described in table 1, and the characteristics of the cross-sectional and case–control studies are described in the online supplementary appendix 1. It was not possible to pool data due to heterogeneity regarding exposure (backpack) and outcome (back pain) measures. Flow chart of the included studies in this review. The five prospective studies were judged as moderate to high risk of bias for most risk of bias domains from QUIPS (table 2). Two studies21 22 were rated as high risk of bias and three23–25 as moderate risk of bias. The domains of ‘study attrition’, ‘prognostic factor measurement’ and ‘study confounding’ were the most poorly described domains. The domain of ‘outcome measurement’ was the best described. Due to the high heterogeneity between included studies, we have presented results descriptively. Two prospective studies (one longitudinal cohort23 and one RCT22) evaluated associations between schoolbag weight (% BW) and risk of developing LBP; neither reported an association. Based on the QUIPS rating for these two studies, weighting by sample size, we consider this moderate quality evidence for no relationship between backpack weight and back pain. Two longitudinal studies evaluated ‘perception of schoolbag weight’ and risk of LBP. One study21 found that children with back pain who reported difficulty carrying their schoolbag had increased in risk of developing persistent LBP (RR 2.1, 95% CI 1.1 to 4.0). Another study25 also reported an association between the perception of schoolbag weight as heavy and LBP (OR 2.2, 95% CI 1.0 to 4.8). Based on the QUIPS rating for these two studies, we consider this low quality evidence for a relationship between perception of backpack weight and back pain. Another longitudinal study24 did not investigate schoolbag weight or perception of weight; however, for the question on ‘pain provoking situations’, none of the participants mentioned that carrying the schoolbag provoked pain. None of the prospective longitudinal studies reported data on duration of using a schoolbag, episodes of care seeking for back pain or episodes of school absence due to back pain. The results from longitudinal studies are summarised in table 3. Results from longitudinal studies included in the review. Twenty-eight studies investigated weight of schoolbag (% BW), ranging from 5% to 19% BW, and 29 studies investigated load carried, which ranged from 2 kg to 10 kg. Fourteen studies investigated duration of use of the schoolbag (ie, time carrying), ranging from 20 to 85 min per day. Regarding schoolbag design and method of carrying the bag, 22 studies reported that most students used backpacks or rucksacks (around 90%) and carried the schoolbag on both shoulders (around 75%), and a minority of students used satchels or shoulder bags carried on one shoulder or by hand. Twenty-nine cross-sectional studies did not find an association between schoolbag characteristics and LBP.26–54 Four studies reported a positive association between the child’s perception of backpack weight and back pain.55–58 Three studies reported associations between the duration of carrying a back pack (prolonged periods) and back pain.57 59 60 Four studies reported associations between schoolbag weight (heavier) and back pain,60–63 and other three studies found an association between the method of carrying the schoolbags (one shoulder or asymmetrically) with back pain.42 64 65 For the retrospective case–control study, there were no data regarding the schoolbag weight or features, but 75% of the subjects with chronic non-specific LBP reported that carrying a schoolbag aggravated their pain. Episodes of care seeking for back pain were reported in 14 cross-sectional studies.27 30 35 37 38 42–44 61 64 66–69 The prevalence of care seeking ranged from 1.6% to 35% (median 18.5, IQR 8.6–23.3). However, none of the studies investigated the association between schoolbag use and care seeking for back pain. School absence due to back pain was reported in six cross-sectional studies,27 30 38 41 55 61 with median prevalence of 7.8% of absence for one or more days (IQR 1.8–20.5). However, none of the studies investigated the association between schoolbag use and school absence due to back pain. Because we anticipated different definitions of back pain episodes, we planned a sensitivity analysis to explore the influence of episode definition on risk. However, for the prospective studies, the definitions were all were very similar, so we did not perform this analysis. This systematic review provides evidence from prospective studies with moderate to high risk of bias that schoolbag characteristics such as weight, design and carriage method do not increase the risk of developing back pain in children and adolescents. Two prospective studies reported that the perception of heaviness or difficulty in carrying the schoolbag were associated with back pain and persistent symptoms. Evidence from cross-sectional studies supported the findings from prospective studies. Taken together, these results are not suggestive of a meaningful relationship between backpack use or weight and back pain in children and adolescents. The strength of this review is that we focused on data from prospective studies that investigated schoolbag characteristics and the risk of back pain, yet also included cross-sectional and retrospective studies to capture all possible relevant information on the topic. Data from the latter studies were considered with respect to the extent to which they were concordant with the longitudinal studies. In the event that there is a causal relationship between backpack use and back pain, we expected that cross-sectional studies would consistently report an association between the two variables, but this evidence of itself would be insufficient. Hence, we expected that data from cross-sectional studies could corroborate inference of a causal association, or lack thereof in the longitudinal data. In this study, we also performed a comprehensive search, we registered the protocol and we assessed the risk of bias of the included studies using robust methods. This study has limitations. We only found five prospective studies to include in this review. Since these studies investigated different variables and present results inconsistently, we were unable to pool results. Despite these limitations, the volume of research and the fact that associations show no consistent pattern suggest that any relationship between backpack use and back pain is minimal at best, and research resources aimed at understanding adolescent back pain are better directed elsewhere. Previous reviews have investigated the association between back pain and schoolbag characteristics (ie, weight, type, method of carrying) in children and adolescents.9 13 15 70–73 Although most of these reviews are based on data from cross-sectional studies, their results generally agree with our findings (ie, there appears no clear association between schoolbags characteristics and back pain in children and adolescents). Most of these reviews are narrative reviews or investigated risk factors without considering longitudinal data. 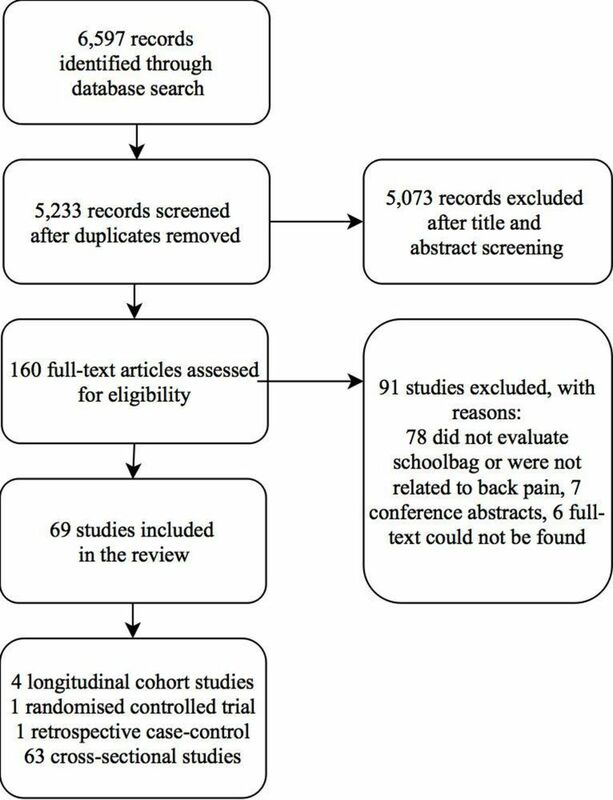 Our review extends the findings of previous studies by providing evidence from five prospective longitudinal studies, which show there is little or no association between schoolbag use and back pain. Schoolbag use does not appear to be an important risk factor for back pain in children and adolescents. However, due to the small number of prospective studies and low methodological quality of the studies included in this review, our findings should be interpreted with caution. There are few longitudinal cohort studies in children and adolescents in the literature, and in most of these cases identifying risk factors for back pain was not the primary aim. Consequently, the choice of exposure variables, measurement instruments and timing of data collection are not optimal to reveal causal relationships. These problems may explain why systematic reviews in this field do not have strong conclusions. These findings call into question the various guidelines and statements that endorse specific weight limits for school bags in children and adolescents.13–15 It seems that these recommendations are not based on the most reliable evidence on the subject. The findings also have implications for the various professional bodies and clinicians that endorse or recommend specific backpacks. It is important that such endorsement is made on the basis of firm evidence and free of financial conflict. Based on evidence from five longitudinal studies (n=1851 children and adolescents) and more than 60 cross-sectional studies, there is no convincing evidence that aspects of schoolbag use increase the risk of back pain. There is some evidence that the perception of heaviness is associated with back pain. TPY holds a PhD scholarship from CAPES (Coordination for the Improvement of Higher Education Personnel), Ministry of Education of Brazil. CGM, CMW and SJK’s fellowship are funded by Australia’s National Health and Medical Research Council. The authors would like to acknowledge Dr Bruno Saragiotto for critical revision of the manuscript and data analysis.
. Why is low back pain common in adolescence? Education and Health 2002;20:36–7.
. Use of backpacks in children and adolescents. A potential contributor of back pain. Orthop Nurs 2004;23:101–5.
. The backpack load in schoolchildren: clinical and social importance, and efficacy of a community-based educational intervention. A prospective controlled cohort study. Eura Medicophys 2004;40:185–90.
. Persistence and change in nonspecific low back pain among adolescents: a 3-year prospective study. Spine 2004;29:2452–7.
. Backpacks, back pain, sagittal spinal curves and trunk alignment in adolescents: a logistic and multinomial logistic analysis. Spine 2005;30:247–55.
. Nonspecific back pain in children. A search for associated factors in 14-year-old schoolchildren. Rev Rhum Engl Ed 1999;66:381–8.
. Gender-age environmental associates of middle school students' low back pain. Work 2006;26:197–206.
. The effects of the manner of carrying the bags on musculoskeletal symptoms in school students in the city of Ilam, Iran. Ann Trop Med Public Health 2017;10:600–5.
. Back pain in school children. A study among 1178 pupils. Scand J Rehabil Med 1994;26:143–6.
. Does the weight of backpacks cause backache in 10-11 year-old children? Acta Pediatrica Espanola 2011;69:325–31. Contributors TPY performed this study as part of her PhD degree, she led the main writing, screening, data extraction and analysis. CGM was her supervisor and contributed with the concept idea and guiding during the study. ACT, CMW and SJK contributed with revision, screening, data extraction and interpretation of the study.